Bishop Vasyl (Semenyuk), eparch of Ternopil-Zboriv, suggested a unique way to resolve the problem – to place the Greek Catholic cathedral of Volyn on the territory of the Lutsk castle. In fact, on that territory was once the Greek Catholic Cathedral of Ivan the Theologian. The mayor said that the old foundation of this church from the 12th century needs to be preserved, rather than building something new. “This will be an archaeological site of world value, and that is why it is not possible to pass it to the church,” Bohdan Shyba said. As an example, the governor mentioned the reconstructed Golden Gate in Kyiv. This “doll” became uninteresting for visitors. Therefore, we must preserve similar monuments. 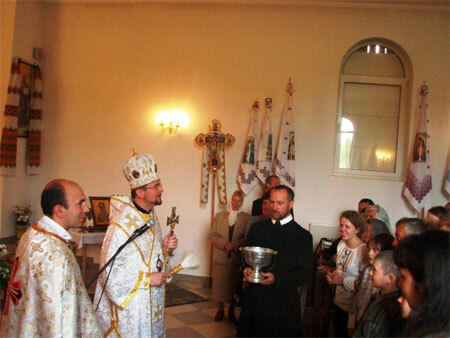 Mr. Shyba promised to help the Greek Catholics in Volyn to find an plot for a new church and wished the UGCC leader to visit Volyn more often. Mr. Shyba said that he himself was born in the Lviv region. According to the mayor, city authority treats all religions with tolerance, but respects the most those that “serve God and Ukraine.” Among such churches a “special place is occupied by the Ukrainian Greek Catholic Church, as great martyr,” reports the Volyn Information Portal. Also, according the press service of the Lutsk Exarchate of the UGCC, on this day Patriarch Lubomyr met with the Chairman of Volyn Oblast Council Anatolii Hrytsiuk. Mr. Hrytiuk thanked the head of the UGCC and all bishops at the meeting for preserving the identity and national spirit, and cherishing the moral and human principles for the development of the society. Discussing a question about returning property of the Greek Catholic, in particular, former churches of the UGCC that are on the territory of the Lutsk castle, the chairman promised to assist the UGCC in finding a place for a cathedral.